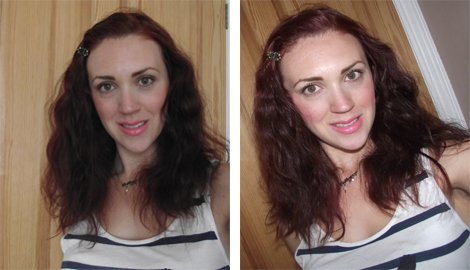 I am in love with BIG hair this Summer, volume and waves has certainly caught my attention. I think since I watched Beyonce live on TV at Glastonbury I've been in awe of her gorgeous locks! Luckily there is a very handy hair styling tool called Heat Wave which may not be able to replicate Beyonces stunning waves but can give me a taste of BIG hair! 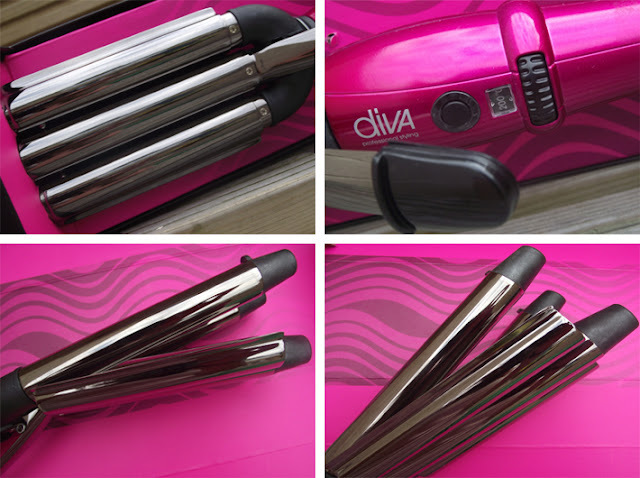 Diva is a professional Hair Styling Brand which offers a huge range of hair styling styling tools. I recently reviewed their Hot Wand which impressed me lots, you can read that review here. I created 2 different looks using the Heat Wave, the first look was very easy and simple. With freshly washed hair which I let dry naturally, I just separated my hair into sections and used the Heat Wave on big sections. To create the second look I simply used the heat wave on smaller sections so that more of my hair got the wave look. Then once I finished the all whole head I simply used my fingertips and ruffled in between the sections to create a fuller effect. I used a small clip just to pin back a small part of the front. The magic behind these locks is the design of the waving iron, this is described as a triple barrel iron. On the front of the iron you have a small lever which once pushed down then opens up the barrels. You simply slide this onto your sectioned hair and then release the lever to clamp down on your hair. You have an On/Off button which you hold down and then a red light comes on and flashes until it has reached the desired heat.Then to turn off you hold the button down and the red light should turn off. You can select your temperature by scrolling the black rotating switch located under the temperature screen. I set mine on 170'c which is enough for my hair. If you have finer hair then a lower temp or if you have course/thick hair maybe a little higher. This does reach 200'c which is mega hot, so be careful! Once your hair is cushioned between the barrels for a few seconds I normally say between 7-10 seconds depending on the amount of hair. Push the lever down to open up the barrels and then you have your wavey locks! I must admit that I think I'm preferring this over the curling wand purely because I just love the wave effect on the hair. The Heat Wave is priced at £49.99 and available on Amazon, the only other Brand which I know has something similar is by Babyliss and theirs is also priced at £49.99 so this is fairly priced. Have you tried a triple Barrel Wand before?